The D150 Mascaret was intended to be the successor of the D11 series. The two seater design, which was created by Delemontez for the S.A.N. factories in Normandie, leaned heavily on the DR1050. The wing was narrowed a little and the fuselage was shortened. A new tailplane construction with a two piece vertical and one piece horizontal tailplane was used. This tail was later adopted by the DR1050 series. The aircraft was given a single large fuel tank behind the seats, carrying 110 litres of fuel. Furthermore, two tanks of 40 litres each were housed in the inboard wing leading edge, giving a total of 190 litres of fuel, good for a staggering 10 hour endurance. The tank behind the panel that is installed in the DR1050 did not reappear in the D150, resulting in much more space behind the panel, which has always been a problem in the DR1050. The new tailplane configuration, and in particular the one piece all moving horizontal tail, is so much more powerful than the original narrower two piece version that the CG envelope has been opened quite a bit farther. This is also why Delemontez could get away with just the fuel tank under the bench seat, and without the tank behind the panel to balance it. All the models following the D150 (the DR200 series and so on) have this larger rear tank and no panel tank. It was fitted with a 100 hp Continental O-200A engine. Interesting note is that the D150 prototype (F-BJST) was originally fitted with the new two piece vertical tail, but still had the old style two piece horizontal. The subsequent production aircraft all had the new tail configuration, which was later also retrofitted to the prototype. The prototype was fitted with the rather blunt wheelpants of the DR1050 Ambassadeur, whereas production models received the sleeker Sicile pants. The D150 design proved successfull, even though only 61 of the breed were produced at S.A.N. in Bernay. S.A.N. 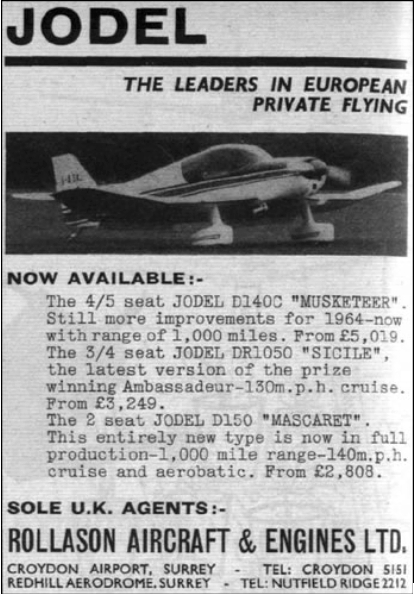 decided to market it at a lower price than the 3/4 seater DR1050. This despite the fact that it didn't cost less to build. In fact, S.A.N. lost money on every D150 that was produced. Among other things, this was what in the end led them into bankrupcy. S.A.B. was still selling plans and even kits for homebuilding. 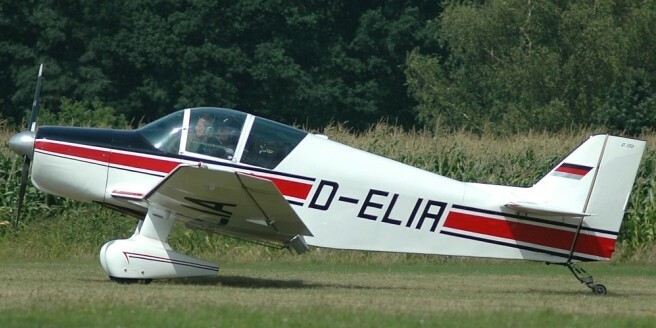 2 June 1962 - First flight SAN Jodel D.150 Mascaret French two-seat single-engined light aircraft built by Société Aeronautique Normande. Like the DR1050 / 1051, the Mascaret is also fitted with either a Continental O-200 or a Potez 4E20 engine. The latter model being desgnated D150 A. A 135 hp Franklin engine has been tried, and a few of these have actually been built. Homebuilt D150's usually mount O-200's, even though an O-320 fitted "Super Mascaret" is flying in the UK. The Mascaret is cleared for mild aerobatics.